Author mapleridgedentalPosted on September 19, 2016 Leave a comment on Why Does Food Taste Funny After Brushing? If you could have any superpower, what would it be? Would you choose super strength? How about the power of flight? Maybe you’d like the ability to see through solid objects! Although super strength and flight may not com too easily, you don’t have to search far for x-ray vision (in a manner of speaking)! Today, we want to share with you a little bit about x-ray and how we use them in our practice to spot troublesome cavities and other issues before they have a larger effect on you smile! X-rays were first observed in 1895 by German physicist Wihelm Conrad Roentgen (1845-1923). Roentgen accidentally made this discovery while conducting an experiment testing whether cathode rays would pass through glass. After covering the glass cathode tubes he was using for his experiment, he notice a glow coming from a nearby chemically coated screen. He was unsure what rays were causing the glow so he dubbed them”X-rays” for the time-being, and the name stuck! Roentgen is also credited with discovering the medical use of X-rays. The first photograph of the human body part using X-rays is actually his wife’s hand! 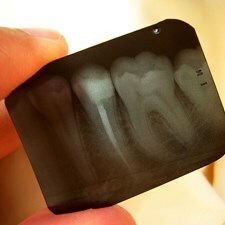 X-rays have become a incredibly valuable tool in modern medicine-especially for dentistry! We learn a lot from visually examining you teeth, but not everything is visible to the naked eye during a routine dental exam. Dental X-rays allow us to detect and diagnose tooth decay between teeth, on hard-to-reach surfaces, and under existing dental work. X-rays can even be helpful in identifying dental and orthodontic issues that exist beneath the gum line– something that was impossible without invasive procedures before X-rays became widely available. Both traditional and digital x-ray exams are safe. Though low levels of radiation are used to capture the X-ray images, each techniques is designed to limit the body’s exposure to radiation. A leaded apron and thyroid collar are often used to minimize exposure to the abdomen and throat during examination. These protective measures are helpful for everyone, but especially recommended for women of childbearing age, those who are pregnant, and children. If you are pregnant and in need of dental x-rays, be sure you tell you dentist. They will be sure to use the leaded apron and thyroid collar during your exam to protect you and your fetus from any radiation. Dental x-rays do not need to be delayed if you’re breastfeeding or trying to become pregnant, but talk to your dentist if you have any questions or concerns. Top image by Flickr user Bashar Al-ba’noon and used under Creative Commons Attribution-Sharealike 4.0 licence. Image cropped and modified from original.